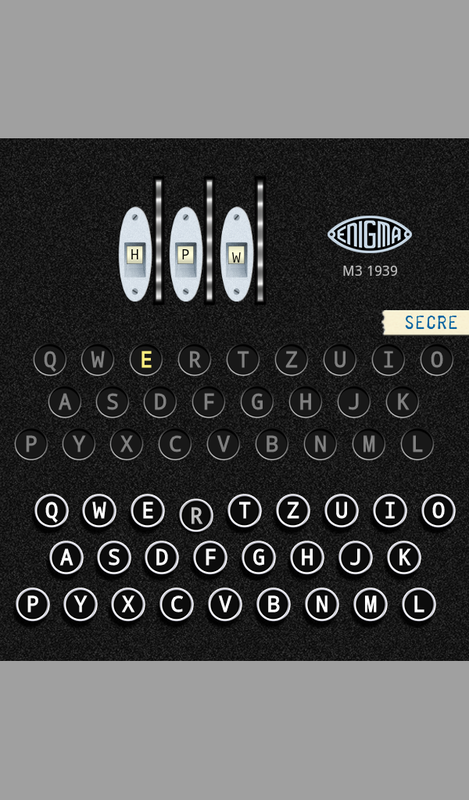 Looking on the Android market, I found two Enigma simulators already available. One was a decent quality paid-for application, the other was free but poor quality (with logic errors and a hard-to-use UI) and neither took good advantage of the extra screen space on a tablet. I decided to go ahead and give our Enigma simulator a proper, realistic UI, add features to do more than the currently available apps, make better use of the extra space on tablets and publish it. Had I known then that it would take 2 months of days off, evenings and weekends to do I would probably have thought twice! Another overlap with the client work I’ve been doing is the area of in-app payments. As I’d been investigating security measures to protect in-app payment transactions from tampering on Android devices, I started thinking about whether in-app payments could be taken advantage of in the Enigma simulator. I’m a big fan of the work being done by the Bletchley Park Trust to preserve the historic code-breaking site, both as a memorial to the great work done there and as an educational resource. We’d already decided to include in-app advertising as a possible way of recovering some of our development costs, so we decided to also include a payment option to allow people to turn the ads off and at the same time donate to the Trust. It’s not expensive (just £1) so I hope a good proportion of the users will take that option as it’s in a good cause. At least 50% of the proceeds will go to the Trust and, if we ever reach the point of recovering our development costs, we will look at increasing that percentage. The app is available now on the Android Market, and we already have a couple of paying customers and a nice review, so that’s a good start! Accompanying documentation is available on our wiki, and I have a long list of potential features that didn’t make the cut for the first release. If you have an Android device please try out the app, please donate if you like it, give us a review on Android Market and let us know about any improvements you would like to see in future versions. Finally I’m wondering whether similar apps could benefit other charitable institutions using this payment model; one obvious candidate would be the National Museum of Computing (based on the Bletchley Park site but not sharing any of their government funding). Perhaps a Colossus simulator, what do you think? This entry was posted on 4 February 2012 at 5:50 pm	and is filed under Applications, Enigma, Payment. Tagged: enigma simulator, world war ii. You can follow any responses to this entry through the RSS 2.0 feed. You can leave a response, or trackback from your own site. it is a shame that you charge money for this app especially if there are about 50 on the net for free but not as apps. Sorry, I think you have misunderstood; the app is completely free to download and to use, the donation is entirely optional (the only effect on the app is to turn off the small advertising banner). As the BBC says, “other [apps] are available”; we do believe ours is the best Enigma app on Android though – it certainly is the most popular both by number of downloads and by review ratings. I would LOVE a Bombe app.. perhaps that could be next, and another £1 to £2 to the Trust.. I would love a Bombe app too 🙂 The main challenge is how to represent it on a small screen, I’m not sure how to manage it on a phone-sized display, maybe with some kind of scrolling and zooming. Definitely on the wish list, but it’s a very big project so please don’t hold your breath waiting for it! In the meantime, there is a really good Bombe simulator for bigger screens written by Magnus Ekhall & Fredrik Hallenberg, please do try it out. Could you compile a version for the iPhone?